Paul Hughes briefs and argues cases in appellate courts, with particular emphasis on cases involving intellectual property or financial institutions. Paul argued a trademark case at the Supreme Court in December 2014, an ITC patent appeal at the Federal Circuit in October 2014, and en banc Ninth Circuit appeal in June 2014. All together, Paul has argued 9 appellate matters, drafted more than 125 appellate briefs, and worked on more than 50 cases before the US Supreme Court. Paul co-directs the Yale Law School Supreme Court Clinic, which represents civil rights, immigrant, and criminal defense litigants before the U.S. Supreme Court. He has previously held appointments as an adjunct professor at Georgetown, Johns Hopkins, and Yale. After graduating from the Yale Law School, Paul clerked for Honorable Diana Gribbon Motz of the Fourth Circuit. In this case, we argued that a police officer who participated in a SWAT-style raid of the plaintiffs’ barbershop should be liable for violating the plaintiffs’ Fourth Amendment rights based on his integral participation in the raid, although he did not personally handcuff or search them. 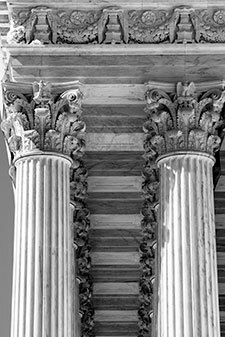 This case addresses what standard a district court should apply in deciding whether to enhance damages for patent infringement under the Patent Act. The U.S. Supreme Court has granted our petition for certiorari. In our opening brief, we argue that the Federal Circuit’s decision is inconsistent with over one hundred and fifty years of Supreme Court jurisprudence regarding patent exhaustion.